Geotiff Maps of the Sheep Range, suitable for use with a cellphone or tablet in the field. Since cell phone coverage might be spotty, these should be downloaded prior to going to the field. ianMICRODEM, for Android. This has no licensing restrictions and can be freely used by anyone for any purpose. Avenza PDF maps which is is free for personal, non-commercial use. Commercial, educational, and government licensing is available. KMZ files of the geology to support French and Guth (2016). You should be careful not to blow these up too much; they were mapped at 1:24K or smaller scales, and the current high resolution imagery reveals the improvements possible with 1 m imagery. 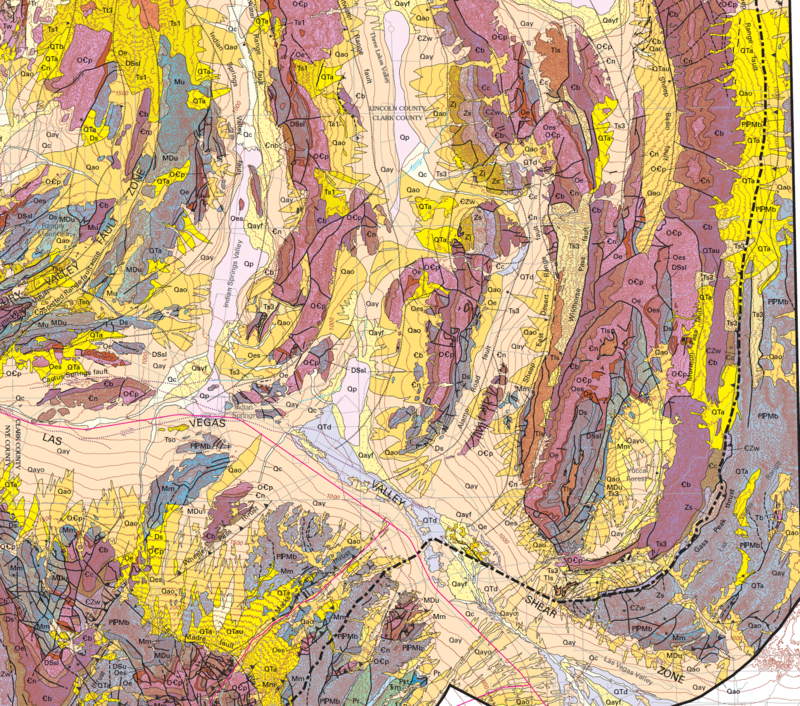 Extract of USGS MF 2381 (Workman and others, 2002) with the geology of the field trip. Devonian megabreccia over Tertiary conglomerate over Ordovician bedrock, Black Hills Gap. Hoodoos developed in brecciated dolomite, Hidden Forest road in Deadman Canyon. French, Don E., and Guth, Peter L., 2016, Megabreccias of the Sheep Range, Clark County, Nevada: 2016 Field Trip Guidebook, Nevada Petroleum and Geothermal Society, 50 p.
Guth, P.L., 1981, Tertiary extension north of the Las Vegas Valley shear zone, Sheep and Desert Ranges, Clark County, Nevada: Geological Society of America Bulletin, vol.92, no.10, p.763-771. Guth, P.L., 1986, Bedrock geologic map of the Black Hills 1:24,000 quadrangle, Nevada: U.S. Geological Survey Open File Report 86-438, map, section, and 10 page text. Guth, P.L., Schmidt, D.L., Deibert, J., and Yount, J., 1988, Tertiary extensional basins of northwestern Clark County: in Weide, D.L., and Faber, M.L., (eds. ), This Extended Land, Geological Journeys in the southern Basin and Range, Geological Society of America, Cordilleran Section, Field Trip Guidebook, p.239-253. Workman, J.B., Menges, C.M., Page, W.R., Taylor, E.M., Ekren,E.B., Rowley, P.R., Dixon, G.L., Thompson, R.A., and L.A., 2002, Geologic Map of the Death Valley Ground-water Model Area, Nevada and California, U.S. Geological Survey Miscellaneous Field Studies Map MF-2381-A to E, 1:250,000.